More than ever, NGOs are leveraging technology for humanitarian aid, often in some of the most remote areas in the world. And, increasingly, “for vulnerable communities, access to connectivity is becoming as important to a successful future as access to food, water, and shelter”. The nonprofit sector, like many others, is undergoing a digital transformation that is changing both how internal operations are managed, and more importantly, how critical and life-saving services are delivered to those in need. Underlying this transformation is a shift in how people must learn, collaborate and innovate within organizations. For NGOs, human capacity is the single most important lever in digital transformation and in achieving greater impact. It’s also the area where technology companies like Okta and our peers may have the most to offer in terms of support for the nonprofit sector. New research released by NetHope’s Center for the Digital Nonprofit (a major grantee of the Okta for Good Fund) found that the NGO sector is facing several key gaps in digital skills. The Center’s team surveyed more than 300 leaders of global nonprofits across 49 organizations – and combined revenues amounting to over $20 billion USD annually – to provide a window into organizational and individual competencies. What they found were specific areas of learning growth for nonprofit workers—as well as a hunger to learn more. Digital Responsibility: NGOs arguably protect some of the most critical personal data in the world, whether they are serving refugees fleeing war or delivering life-saving medical aid to vulnerable populations. However, only 57% of respondents believe their organizations have the skills to be digitally responsible. More training for NGO staff on issues such as data protection and privacy is essential as new skills are needed to protect beneficiaries in a digital world. Highly-Adaptive Collaboration: Most nonprofits work in a global environment, where real-time situations may require faster decision making to respond to changes on the ground—but less than half (only 45%) of organizations feel empowered to change direction quickly when needed, limiting the sector’s ability to respond effectively. Part of the challenge lies in the nature of the restricted funding of many large grants, which do not allow for mid-stream changes in methodology or program structure. Entrepreneurial Spirit: Those of us in the tech sector know that failure is an essential step on the path to success. Still, 71% of NGO staff respondents do not believe it is okay to fail when trying something big. The problems NGOs go after are audacious and bold, but the solutions applied to them are held back by a fear of experimentation and failure. Challenging old ways of doing things requires a cultural shift, leadership and, in some cases, new streams of funding. How Can We/The Tech Sector Help? These results are striking, and the entire technology sector is taking notice. For the first time ever, #ImpactCloud tech companies came together to sponsor this Digital Nonprofit Skills research. Okta, along with our partners at Box.org, DocuSign IMPACT Foundation, Oracle NetSuite, Salesforce.org, Splunk, Tableau Foundation, Twilio.org, and Workplace by Facebook, have put a stake in the ground to say that building human capacity in NGOs is something we care deeply about. Together, we are also working on long-term support for digital skills through the Center for the Digital Nonprofit and the broader NGO sector. Build Relationships: At NetHope’s Global Summit last month, our #ImpactCloud team sat down with leaders from dozens of NGOs to hear firsthand how the results of the DNS relate to their organizations. There is no substitute for sitting around a table and having a candid conversation with those we are trying to support! What we heard was that they have a limited capacity to overcome some of the barriers identified in the report, particularly around entrepreneurial spirit. They want to know: What are the needed mechanisms that allow people to engage in entrepreneurial thinking and new kinds of collaboration? Share Insights: At the Summit, Alex Salazar, our VP of Product Strategy, offered insights learned from the private sector on the strategies some of the world’s largest organizations are employing to transform their businesses with technology. His pillars around executive buy-in, budget, culture and iteration laid the groundwork for NetHope members as they embark on this journey. Find his full talk (starting at 7:45) here. Make our Talent Available to Help: #ImpactCloud members such as Oracle NetSuite, Salesforce.org and Tableau have robust and longstanding pro bono programs that connect their employee experts with NGOs. These exchanges are not just about technical help but can also be fertile ground for knowledge sharing around radical collaboration, iteration and experimentation. As more tech companies build pro bono programs, this is an area to focus on to truly build NGO capacity. Fund for Innovation: As corporate philanthropists, the tech sector can do more than give away software or make our employees available as volunteers (though both are important!) We can also support NGOs with grant funding that allows for the innovation and risk-taking that is sorely needed in the sector. Twilio.org’s Impact Fund is a great example of this, along with Okta, Box.org and Oracle NetSuite’s commitment to being founding partners of the Center for the Digital Nonprofit. More risk capital can enable greater impact, and corporate funders can lead the way here. This research is just a first step. We’re excited to keep going deeper and finding new ways that we can leverage the best of our #ImpactCloud organizations (and our 500,000+ collective employees) to support our partners in the NGO sector. We also know that none of us can solve hard problems alone. We’re thankful that collaboration is such a centerpiece of the good work we’re a part of with partners like NetHope and #ImpactCloud. Much more to come. 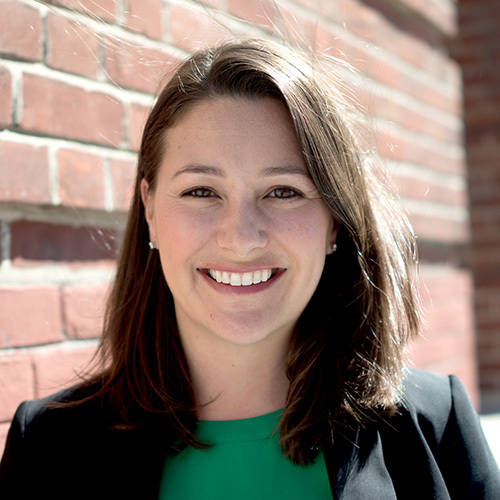 Erin Baudo Felter is the founding Executive Director of Okta for Good, Okta’s corporate social impact initiative. She is charged with leveraging Okta’s most important assets – our people, product and company resources – to accelerate the impact of mission-driven organizations around the world. Erin has worked at the intersection of business and social impact for over a decade and has held various corporate social impact roles at Zynga, Yahoo and Warner Bros.
Erin holds an MBA from the UCLA Anderson School of Management and a BA from the University of Texas at Austin. She is personally passionate about justice and equity in education and serves on the advisory board for Citizen Schools California. She lives in Berkeley with her husband and two young children.